Yesterday, we told you that a thinner Apple Watch (by 20% to 40% compared to the current model) could be unveiled during WWDC in June. Besides a thinner design, we could see the Apple Watch 2 come with a FaceTime camera, offer a longer lasting battery, and work as a stand alone device. If so, that means the Apple Watch 2 would be able to make and take phone calls from your wrist, and receive notifications and more without having to be paired to an iPhone. For 60% of current Apple Watch users, it really doesn't matter what the next version of the timepiece does, they have already made the decision to buy it. That is according to a new survey produced by marketing company Fluent. Of the 2578 people surveyed, 8% own an Apple Watch. Approximately the same percentage own a smartwatch made by another manufacturer. That leaves more than 80% of the respondents owning no smartwatch at all, a big chunk of potential buyers for all smartwatch manufacturers to go after. The biggest reason for not purchasing an Apple Watch, according to the survey, is the price of the device. 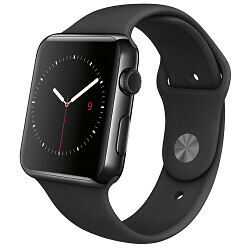 After a $50 price cut announced last month, the starting price of the Apple Watch is $299. Those who already own the product pointed to convenience and features as some of the main reasons why they wanted to own the device. Much further down the list was fashion and affordability. With such a large percentage of Apple Watch users already deciding to buy the next version of the timepiece, it is the remaining 40% that will look hard at the new features of the next-gen wearable to see if it is worth upgrading to. Very loyal pets apple has grown, kudos to them. Not a chamce in hell 60% maybe 13% most feel nothing good came of the watch. And wasted the money if they waited a few months they coupd have saved a hundred or so on it. If the Apple watch 2 comes with the rumored features mentioned in the article then they all have a good reason to upgraded. Hell I might get one if the design is right and I don't need my phone to text and take calls, that would basically make the watch 2 an entry level smartphone. I probably won't get one because the price is sure to be to high. I've never understood this attitude that it's bad that Apple have earned a great reputation. Surely that's a good thing? If it's for inferior and/or overpriced products, it's no good for us consumers, only good for the seller's shareholders and blind followers. If it's for great bang for buck products, it's good for both sellers and consumers. Regardless of brand. Like those who upgrade from Galaxy S6 to S7 the moment it's released or who are desperate for the new Note and would also buy sight unseen? When people have a device they like they usually want to upgrade to the next version and ALL fanboys are the same like that, it's just that the anti-Apple crowd are desperate to use an "iSheep" comment every 10 seconds or they burst. there was major updates between s6/s7 water resistance and memory card, things apple has never offered. and there are probably more. So Apple watch users who might want to upgrade for one 20-40% thinner with better battery and Facetime camera aren't getting upgrades? People here just want to label Apple users as sheep and Android users as smart, simple as that. It all looks a bit desperate and insecure to be honest. I'm quoting the article we're commenting on. Write a letter of complaint to PhoneArena if you don't like it. What about iPad Air, the iPhone 6 or possibly the most glaring iPhone 4 ? iPhone 4 went 25% thinner a sixth bigger battery and was a undisputed battery champ at that time. Who isn't eager for a new iPhone that's thinner and with better battery life ? Major update? The S7 was equivalent to an "S" model iPhone dude. There was nothing major about it. Most of it was features that it took out the previous year and they had to put them back in. It was more of a refresh. The three tumors of the Apple Watch is more major considering that it will only be a second gen watch. Don't tell that to the Sammy sheeps. They can't see through their blinded eyes anymore and say that the S7 is a revolution. Exactly!! Most of these tech comment sections are made up of like 80-90 percent Android fans. It's pretty rare that an Apple fan start the bashing unless it's some troll. It usually some android fan with the first slick comment and then it begins. That's why most Apple articles are so popular. That is one insecure bunch. Expecially the guy your replying to. Yes, I never understood Apple vs Android. Android is nothing but software lol! Then you don't read here very often. Anyone who states they will buy a product sight unseen, before it's even announced, is a sheep. I'm very interested in the Note 6, but I have no idea if I'm going to buy it. How could I? I know nothing about it. When I had my Galaxy S3, I was excited for the S4. Then it came out. They say that on the strength, it'll be better than what they currently have and like. It's not sheepish, it's trusting a brand.